A full day of free special events and programs unfolded across Central Park on March 20 to celebrate the first day of spring. Conservancy teams have been preparing the Park for months for warmer weather, and Central Park Celebrates Spring encouraged the community to take part in all that this season has to offer! Dozens of visitors enjoyed a free birdwatching tour through the Ramble in celebration of spring. Located along the Atlantic Flyway, Central Park welcomes more than 270 migrating bird species each year. 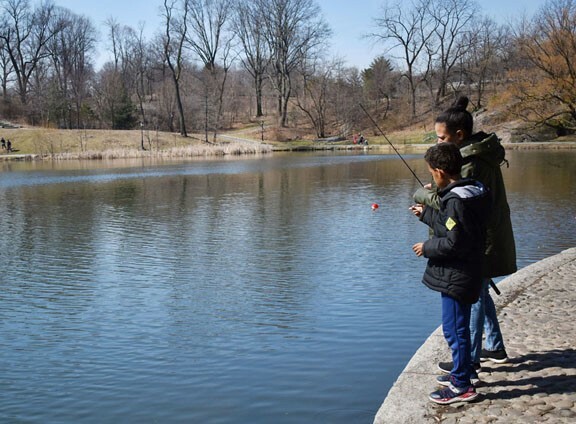 From the Harlem Meer to Columbus Circle, Park-goers of all ages gathered for volunteering, catch-and-release fishing, walking tours, pop-up readings, and more! The day started off with a landscaping project at the Pool, where two groups of volunteers readied the area for spring. Some removed bramble from the northern bank of the Pool, where mugwort and sweetgum had become overgrown. 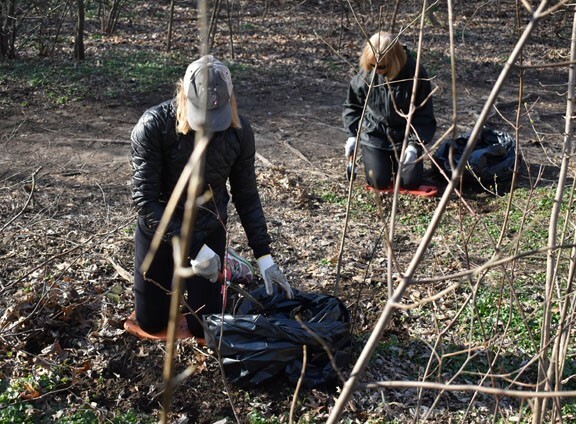 Volunteers fill a variety of essential roles to keep Central Park clean and beautiful. As part of our celebration, we hosted a volunteer drive at the Pool, where groups helped remove an invasive species called lesser celandine. Meanwhile, children at the Harlem Meer were casting their lines. Using corn kernels as bait, the amateur fishers tried to hook the carp and bass spotted in the shallows of the water. The Meer is also home to catfish, bluegill, black crappie, and even some turtles. Catch-and-release fishing at the Harlem Meer is a favorite community pastime in Central Park. Fishing poles are available to borrow at the Charles A. Dana Discovery Center. One young fisher said he was on a mission to catch a fish in each of the 50 states; another was fishing for the first time. Some veterans joined them along the banks of the Meer with tackle boxes in hand. For many, fishing on the Harlem Meer is a daily ritual. If you don’t have your own rod, stop by the Charles A. Dana Discovery Center to borrow one and join in the fun. 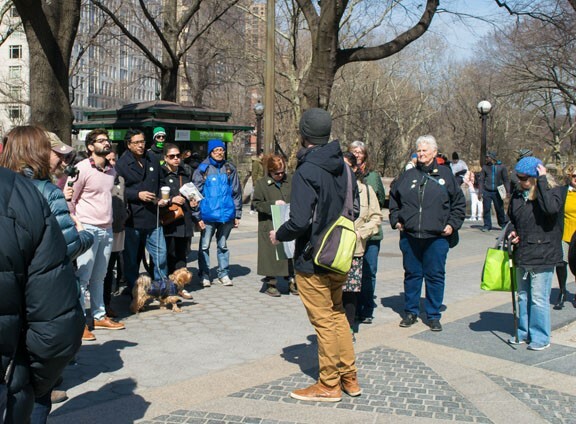 Ryan Schmidt, Central Park Guide, led two exciting walking tours over the course of the day. In the morning, Birding Basics: The Ramble introduced more than 30 visitors to the art of birding in one of the Park’s gorgeous (and recently restored!) woodlands. 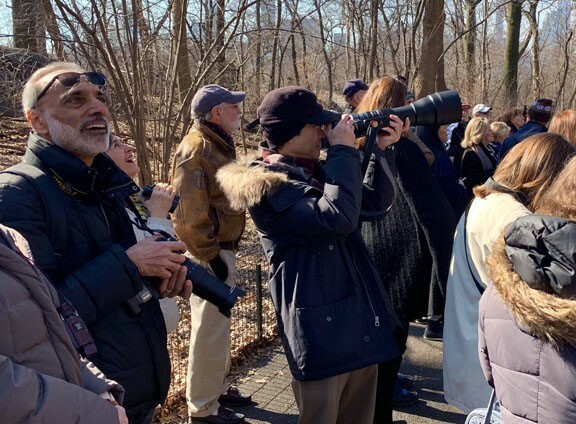 Thanks to its location along the Atlantic Flyway, Central Park sees more than 270 species of birds each year, and the Ramble is a long-favored spot for birders new and old. Stroll to Strawberry Fields features stops at Maine Monument, Sheep Meadow, Tavern on the Green, and more. Ryan Schmidt, Central Park Guide, led a large group on this fun tour through the Park’s southwestern corner. In the afternoon, a group set out to see the southwestern part of Central Park in a different way. From the Maine Monument to Heckscher Ballfields and across the finish line of the annual NYC Marathon, tour-goers on this Stroll to Strawberry Fields learned about the Park’s design and architecture, statues, and landscaping. Of course, the tour’s final destination honors the music legend and anti-war activist John Lennon at the iconic Imagine mosaic. 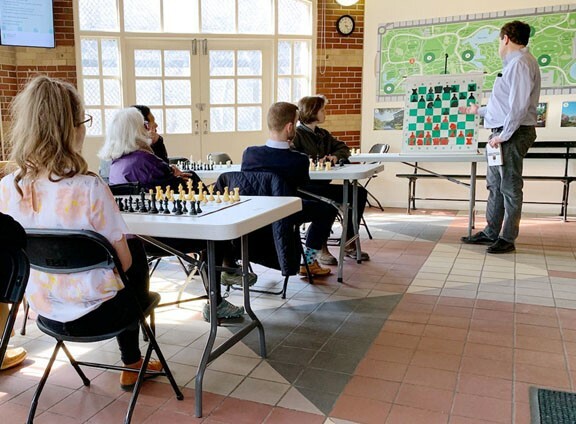 With the help of chess expert Ed Feldman, players of all skill levels learned some tips and tricks at the Chess & Checkers House during an afternoon tutorial and some games. With both indoor and outdoor game tables available, players can practice their craft here year-round. Chess expert Ed Feldman shared tips and tricks with players of all skill levels at Chess & Checkers House. Visitors can practice their craft here year-round at the indoor and outdoor game tables. 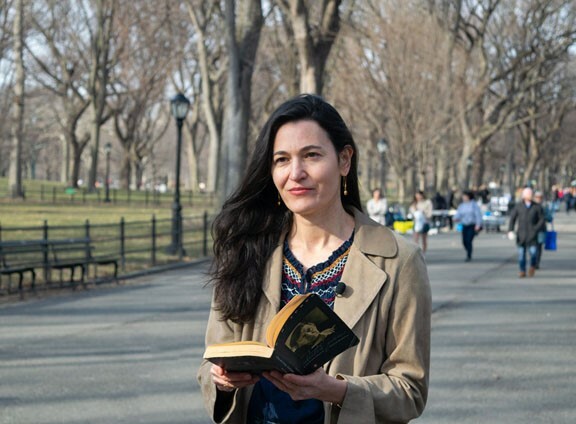 As the day wound to a close, authors Mark Bittman and Nicole Krauss appeared at Literary Walk for a pop-up reading featuring spring-themed works. Mr. Bittman read from the E.B. White classic Charlotte’s Web, a favorite in his family. Ms. Krauss shared poems including William Carlos Williams’ “Spring and All” — perfectly timed on the eve of National Poetry Day (March 21). 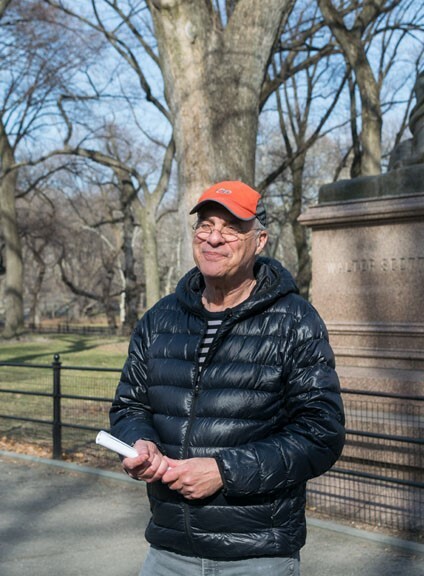 Renowned writer Mark Bittman participated in a pop-up reading on Literary Walk. He read from the E.B. White classic Charlotte’s Web, a favorite in his family. While visitors enjoyed the first taste of spring in the Park, many others followed along on social media with the hashtag #SpringinCentralPark. We shared behind-the-scenes videos about our restoration of Belvedere Castle, our care of the Park’s ornamental fountains, what to expect this spring in Shakespeare Garden, and more. Betsy Smith, President & CEO of the Conservancy, chatted with WNYC’s “All Of It” to talk about springtime plans, and TV crews peppered the Park throughout the day to share stories. Missed the day? There’s plenty of time to enjoy Central Park this season! Download our free Spring Guide and read our blog post on upcoming events and programs for some fun ideas.